Putting your Galaxy S9 in Immersive Mode lets you truly enjoy the gorgeous display that Samsung is so famous for. You can't have it set on at all times, however, so you'll still have to deal with the status and navigation bars that cut the phone's aspect ratio down to that of a standard phone. But if you're willing to dig a little deeper, there are ways to go full Immersive Mode on your S9 for good. With One UI, Samsung has ditched the option of hiding the navigation bar on your S9 via a small circular button in favor of gesture-based navigation controls that get rid of the bar entirely. You're still left with the status bar to deal with, however, and while it's transparent when on the home screen, the status bar will often turn opaque depending on that app you're currently using. Thankfully, it's possible to hide your Galaxy S9's status bar and go full immersive using a method that's been out for a while. Though the process doesn't require root, you'll need to run an ADB command. Keep reading further if you want to get the most out of your S9's gorgeous display — just be sure to follow the steps exactly as they appear, especially if this is your first time with ADB and Fastboot. After installing ADB and turning on USB Debugging, connect your Galaxy S9 to your computer with a USB data cable. Next, swipe down from the top of your screen and select the "Android System" notification, then choose "Transfer files" from the popup. Running an ADB command is necessary hide the S9's status bar to keep it on Immersive Mode at all times. 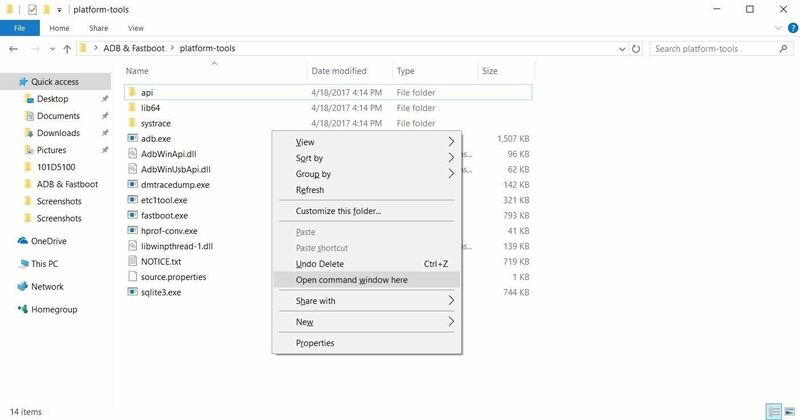 Because of this, you'll need to open a Command Prompt or Terminal window in the platform-tools folder inside of your ADB installation directory. If you downloaded the SDK Tools from Google and did a default installation, go to the C:\Program Files (x86)\Android\android-sdk folder. If not, go to the folder where you installed ADB, then open the platform-tools folder located inside. Now, hold the shift button on your keyboard, then right-click within the window and choose "Open command window here." If you have a Mac or Linux machine, open a Terminal window and change directories to the platform-tools folder. Perform a search on your hard drive for "platform-tools" if you don't know where it is, as the folder's exact location can vary depending on where you extracted ADB and Fastboot when the utilities were installed. Opening an ADB command window on Windows. If you need a more detailed walkthrough about the subject, head over to our full ADB and Fastboot guide to get to know this important modding process better. Immediately after sending the above command, your status and navigation bars will disappear. At this point, it would be a good idea to restart your phone so that any apps that were previously open can redraw themselves to accommodate the extra screen real estate. From now on, you'll still be able to access the navigation and status bars on your S9 by swiping in from either the top or bottom of the display, depending on which one you wish to access. The keyboard will still pop out as it normally does whenever you tap on a box that requires text input, and the home button's haptic feedback still remains active, but you'll need to reveal the navigation buttons to access Google Assistant.